I don’t think I’ve ever met anyone who doesn’t like dessert. Whether it’s cake, pie, cookies, or ice cream, it’s all good. The people at Looney Labs must really love dessert because they’ve created a whole game based on yummy food items. (I wonder how much weight the designers and play-testers gained while working on this game, as it tends to make you hungry.) If you can resist the urge to ransack your kitchen or the local bakery after playing this game, you can have all the fun of making and serving lots of desserts without the extra poundage. In Just Desserts, you are a waiter at a dessert cafe. Your job is to make sure that your guests get the desserts they want, and nothing that they don’t want. Do this well and you’ll win the game. You don’t want your guests leaving the cafe unsatisfied! The game consists of two decks of cards: The dessert deck and the guest deck. Each guest card shows three or four icons across the top, as well as naming each guests’ favorite dessert. The icons represent the dessert ingredients that the guest will or will not eat. 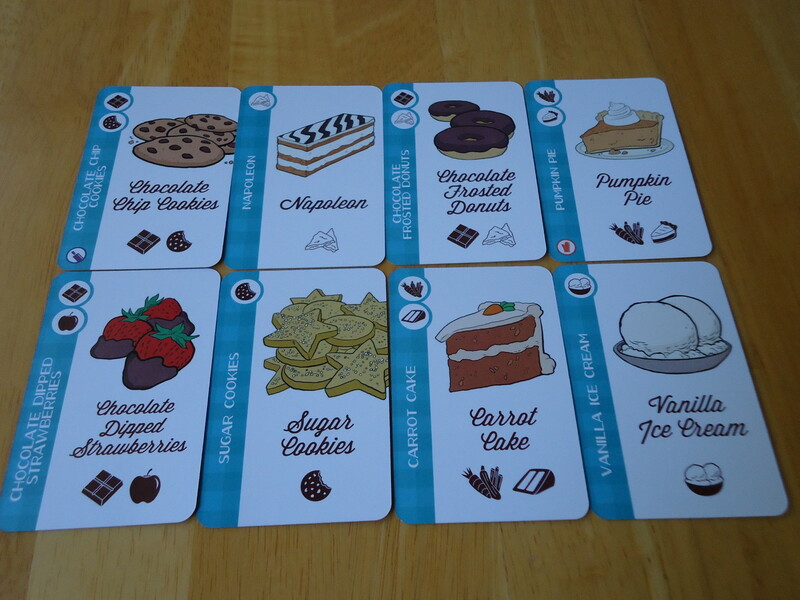 Each dessert card shows these same icons, which indicate the ingredients that make up the dessert. So, for example, the guest named Fuzzy likes peanuts and chocolate, but won’t eat marshmallows. You can satisfy him by playing the chocolate chip cookie card which shows the chocolate icon, and the fruitcake card which shows the nut icon. Although both cards show other icons, none show the marshmallow icon, meaning Fuzzy would eat these items. Fuzzy’s favorite, though, is peanut butter cups, so if you had that card you could play it alone. 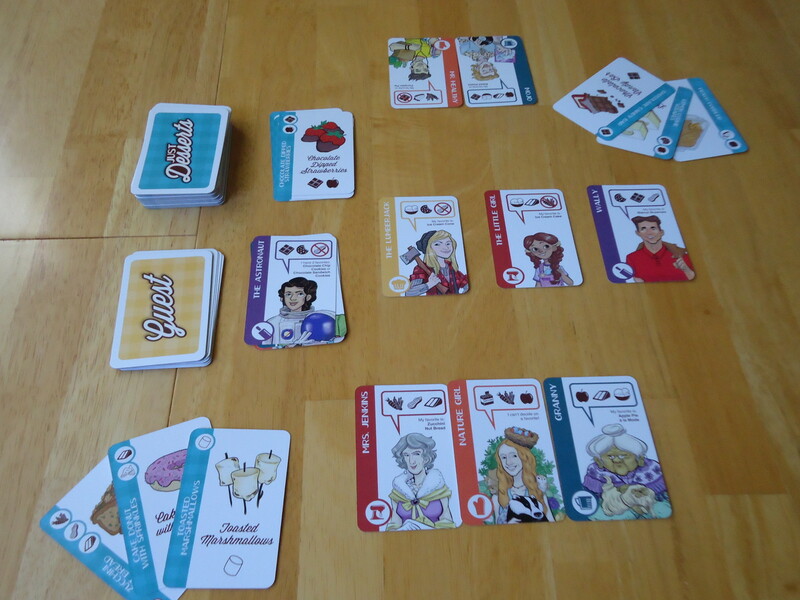 During set up, each player is dealt three dessert cards. Three guest cards are turned face up in the center of the table. The remaining cards in each deck are placed on the table to form draw piles. Satisfy up to two guests. Discard one more more dessert cards (as many as required to meet the guests’ needs without giving them anything they don’t want). Satisfied guests are then placed face up in front of you. If you are able to give a guest their favorite item, you receive a “tip” and you get to draw an extra dessert card. Go back to the kitchen. Draw an extra dessert card. Dump your tray. Discard as many cards from your hand as you choose and then draw back that many cards. Each guest card also shows a suit. If you complete your turn and their are any guests of duplicate suits in the center of the table, remove guests until there is, at most, one guest from each suit showing. Place discarded guests face up on the discard pile. The most recently departed guest (the one on top of the discard pile) is considered to be “standing in the doorway” and is eligible to be served. Your guests. Better make ’em happy. Poaching and Blocking. Poaching allows you to steal a guest that another player has already satisfied by serving them just as you would a guest that’s in the middle of the table.However, your attempt may be blocked if the other player has enough cards to re-satisfy the guest. Opening a Buffet. Discarding four single-ingredient desserts on one turn forces all other players to move one of their satisfied guests back into the middle. Meanwhile, the person who “opened the buffet” draws three more cards and may then satisfy one unclaimed guest. Surprise Parties. You can intercept a guest who is being satisfied with desserts other than their favorite by saying, “Surprise” and providing them with their favorite dessert. Regardless of which ruleset you’re using, the first player to satisfy three guests of the same suit, or five guests of different suits wins the game. Sugar and Spice and Everything Nice, or Broccoli and Brussels Sprouts? I’m always on the lookout for games that will work with a variety of groups and ages. Generally it’s just my husband and I playing games, but a few times a year the relatives come to visit (or we go there) or there’s a social event that needs a game. It’s a plus if the game is portable because I also look for games we can pack in our camper for vacations. Just Desserts scored high on all counts. The game is easily learned by non-gamers and all but the youngest kids. The box says age 8 and up, but I think kids as young as five or six could handle the base game with a little help from the adults, as it’s not much more than matching up icons on the cards and discarding/drawing cards. What’s great about Just Desserts is that it works for kids, but it’s not the kind of game that’s going to repel or totally bore adults. It’s the rare game that both groups can play and enjoy without the kids getting upset or the adults having to “throw” the game to make it competitive. I’d liken it to Labyrinth in that way. The theme and artwork are appealing to everyone (there’s almost no one who objects to dessert). It’s very easy to learn. There aren’t many rules and what there are are well explained and helpfully illustrated. Anyone who has some familiarity with card games like Uno, Monopoly Deal, or Phase 10 should be able to pick this up and play, so it’s a good game to bring out with non-gamers. Finally, it’s portable. It comes in a small box and doesn’t require a huge table on which to play. We played quite a few rounds with it set up between us on the sofa. For all of these positives, some will find the simplicity and broad appeal of Just Desserts to be its potential curse. The problem is that the base game may grow stale over repeated plays. There are few decisions to make beyond looking at your hand, checking to see if you can match up the correct icons and, if you can’t, deciding whether or not to discard a bunch of cards and draw more, or draw just one card while keeping the rest of your hand intact. That doesn’t make it a bad game. In fact, it’s far from it. There is something addictive about it that keeps it interesting long after it probably shouldn’t be. It plays fast, so it scores high on the “one more game” meter. It’s just not something that’s going to provide a ton of strategy or deep thinking. If that’s what you’re seeking, then Just Desserts isn’t for you. 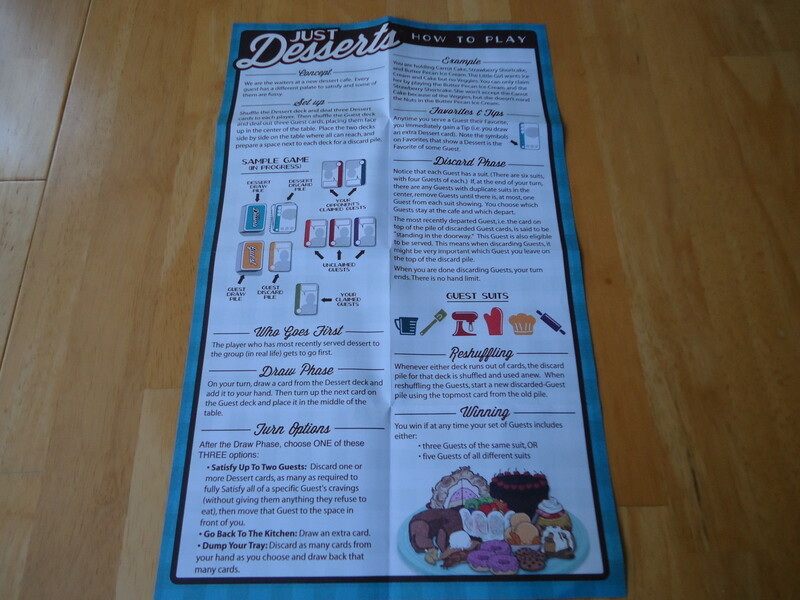 However, one of the best parts about Just Desserts is the inclusion of a set of three advanced rules that makes the game more challenging. Each rule can be included individually, or you can add two or all three. This is nice because if you have someone who wants just a bit more challenge, you can add only one advanced rule. If you’re playing with gamers, you can throw in all three for maximum challenge. Some of the yummy dessert cards. The ability to add just one rule at a time is also great for stepping kids (and non-gamers) upward through the game. They’ll likely easily master the base game, but you can gradually increase the challenge without overwhelming them with a huge new set of rules. Just introduce one at a time until you’re familiar with it, and then try another one. Eventually you’ll be able to add all three without much suffering. The only negative to the extra rules is that they introduce “take that” elements into the game. The base game is pretty much multiplayer solitaire. It’s a quiet, smooth experience that slides down kind of like pudding. There is very little you can do to influence your opponent, with the exception of watching which guest cards you discard and in what order from the center of the table (if you have that opportunity). Since the guest on top of the discard pile can still be satisfied, you want to try to bury a card that your opponent might need underneath another card. You may not be able to do this since not enough cards may be up for discard, but it’s one of the few strategic choices you can make in the base game. Other than that, everything else is simply discarding and playing cards from your hand. 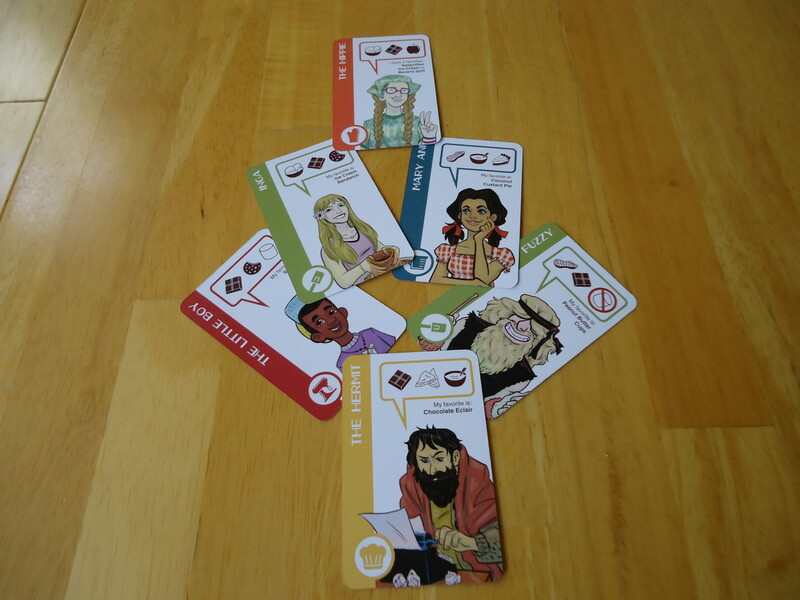 The advanced rules introduce stealing satisfied guests from another player, forcing other players to discard cards, and thwarting a satisfaction attempt by offering the guest their favorite dessert. The more advanced rules you add to the game, the more ways you have to mess with people. If you play with all three advanced rules and people who embrace them wholeheartedly, the game can become a bit mean. If you can give as good as you get it’s fun, but some people aren’t going to like this style of play. Know your audience before adding in the advanced rules. With them, the game goes from sweet, smooth pudding to Sour Patch Kids. 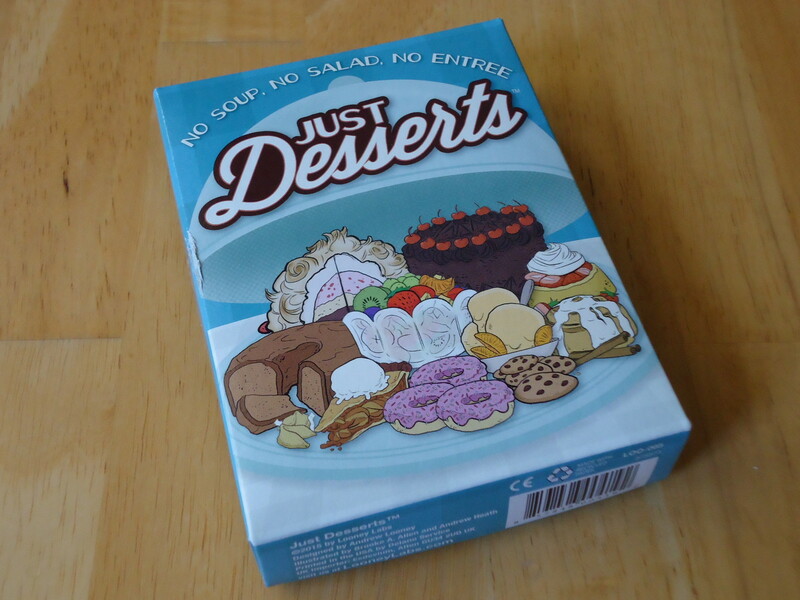 Overall, Just Desserts is a fast, casual game that’s great for nights after a long day at work, gaming with kids and/or non-gamers, parties, and as a warm-up for a game night. It’s not super deep or strategic but it is fun, appealing, and easy. Sometimes that’s all you want or need. iSlaytheDragon would like to thank Looney Labs for furnishing us with a review copy of Just Desserts. Beginner and advanced rules make it appropriate and scaleable for a variety of audiences. Great theme and fun artwork that's good for all ages and groups. Easy and fast to teach, learn, set up, and play. Kid-friendly, but not boring for adults. Scales well at all player counts. This game will blow any diet you might be on. The base game is light on strategy and challenge and may get stale quickly. The advanced rules introduce "take that" gameplay, which may be a turn off to some players.